Don’t know where to begin with your Canadian research? Unlock the uncertainties. This presentation electronically introduces you to the Library and Archive Canada (LAC) collections. 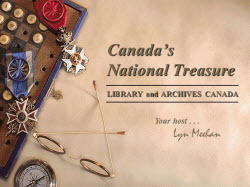 Learn as Lyn virtually navigates through this website, tantalizing you to an endless variety of federal Canadian resources: censuses, land records, immigration and naturalization information, military records, photographs, along with a greater wealth of knowledge that will benefit genealogists in their heritage quest.